Kellie has been working in the youth services sector in Qld and NSW for 20 years. She holds a Bachelor of Social Science (Juvenile Justice) and a Diploma of Management. Kellie is a keen advocate for young people and has extensive experience in developing and implementing programs and services to assist young people to become the best person they can. Throughout her career, Kellie has been actively involved in lobbying and advocating to all levels of Government to ensure young people are heard and provided for. Kellie, what drew you to this role? I have known SYC, through my previous role, for about four years. I knew of the great work they did, and when I saw the role advertised I knew SYC was a place I wanted to work. Their national presence and professionalism were important factors for me. I knew I would learn a lot – and be able to give a lot. What differentiates the Sticking Together Project (STP) from other programs you observed or worked on throughout your career? What sets STP apart from other interventions is the robust research, involvement of young people in the design and development of the program, and the logic behind the model. The tools which are used in the program are amazing for both the young person and the Coaches. They really guide a young person through personal growth and I think, they keep everything really focussed on the goals the young people are trying to achieve. I can already see how the tools can be easily transferrable to other age groups and cohorts. For example, young people in the Juvenile Justice system or young people at risk of leaving school early – I think there will be great opportunities in the future to leverage what we learn from the Sticking Together SIB. What do you think are the challenges that need to be overcome for young people? Why do you think the Sticking Together Project will make a difference? Where do I start?! Obviously, every young person has their own individual challenges, so I hesitate to generalise. Some of the more common challenges include: homelessness (how can anyone focus on getting a job, let alone keeping it, when you don’t know where you are sleeping that night? ); family and domestic violence; drug and alcohol issues; mental health issues (anxiety and depression being the largest issues in this space); and not completing school. Then there are those who have completed school, done a degree and still can’t find or hold down a job because of some of the challenges listed above. STP has already made a difference to so many young people’s lives and I think that is because the young people know they have someone in their corner who is not judging them, who is assisting them to work through their own challenges and knows that their Coach is there for support if (and when) they fall down. Coaching is vitally important as it provides young people with a point of view outside of their norm. The Coach may even be the first person the young person has in their life who not only has a job but has stuck to it too. 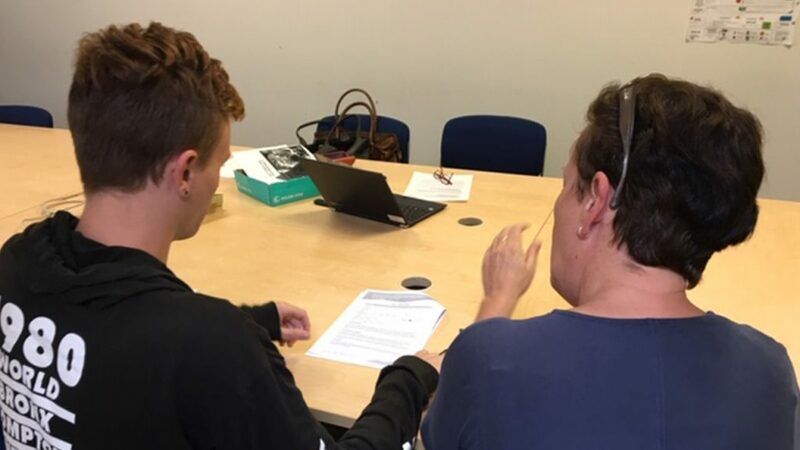 STP was also developed to work closely with employers to help them develop an understanding of the issues some young people face to employment, which ensures they get the best out of their young employee and in turn reduces their staff turnover. What I love about my job is the same as any position I have held in the social sector – the young people. I love that I get to be a part of such an innovative program and think that in some small way I helped to contribute to positive changes in a young person’s life. I love that I get to work with an amazing group of people all working towards the same goal and that I continue to have the privilege of being able to represent the young people we work with, whether that is through internal SYC conversations or external bigger picture conversations. The Sticking Together Project is about supporting young people to get ready for work and find a job that ‘sticks’. What was your first job? And how did your own career get started? My first job was an after-school job at a local fashion company warehouse bagging up and sending out orders to stores. I was actually fired from this job as another co-worker blamed me for something I didn’t do. Anyone who knows me won’t be surprised to hear that I went into the boss and advocated for myself and proved to him that I wasn’t to blame – and I got my job back. I was 16 at the time. My career in the youth sector started because a friend in high school had had a traumatic time growing up and I walked beside her through numerous court cases for sexual abuse perpetrated by her stepfathers, and then a stint of homelessness. Going through this with her made me realise that there was a whole other world, outside of the one I was living in. If I felt adults didn’t think young people were worthy of an opinion, I couldn’t imagine how disempowered those who had been treated so badly by adults felt. So a few years out of high school I started a TAFE course and the rest, as they say, is history. I have had many good coaches and mentors of my own along the way. I can think of a couple of managers that I have had that have really shaped the way I go about my work and were there encouraging me, even when things weren’t easy.